← Alice Annglow: The definition of cottage chic. Every so often I take out this Heisey Ridgeleigh cigarette holder and prepare to list it in my Etsy shop. And every time, I end up putting it right back in the hutch. Why? It’s just so pretty, and feels so good to hold, that I can’t bear to part with it. And I keep thinking that once I have more space, Ridgeleigh may be a pattern I’d like to collect more of. 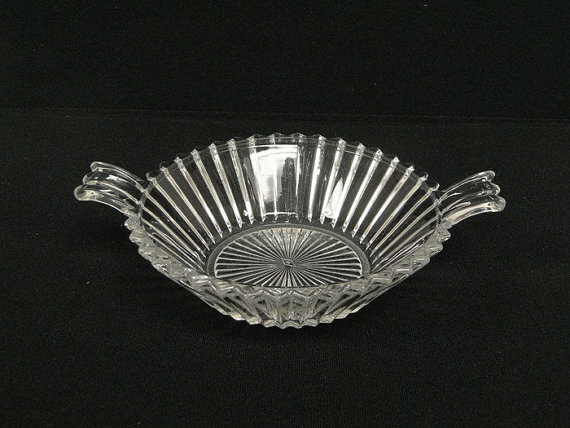 Heisey “Ridgeleigh” candy dish. Photo courtesy of Orange Pawn Shop, Etsy. Introduced in 1935 by A. H. Heisey & Co. of Ohio, “1469 Ridgeleigh” is the epitome of 1930s design. With its sharp angles and ribs, Ridgeleigh features the superb clarity and brilliance for which Heisey was known. In addition to dinner service, “Ridgeleigh” was available in a wide variety of serving pieces, including candelabras, vases and cruets. But Baby Boomers are probably most familiar with the smoking sets. 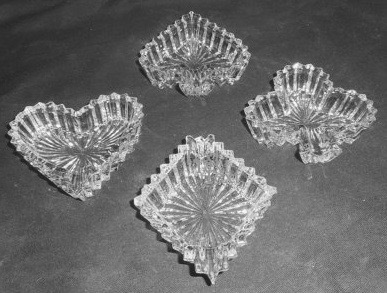 I wish I still had my family’s Ridgeleigh ashtrays! Cigarette boxes were available with lids, and in upright oval and square styles. Ridgeleigh Bridge Series Ashtray Set. Photo courtesy of Ravensbrooke Antique, Etsy. The Heisey company was founded in 1896 by a German immigrant named Augustus H. Heisey after serving in the Union Army during the Civil War. His company produced outstanding hand-made pressed and mold-blown glassware. And, of all things, Heisey also made automobile headlights and lighting fixtures! While many Heisey pieces are available in crystal, the company began producing exotic colors in the 1920s. “Ridgeleigh” pieces were also made in a beautiful green Zircon, and today are very rare and sought-after. Heisey “Ridgeleigh” ashtrays in rare Zircon color. Heisey glass is so beloved that the Collectors of America group was formed in 1971 to celebrate this ever-popular company.. And in 1972 the National Heisey Glass Museum for vintage Heisey glass was founded. Keep a sharp eye out for “Ridgeleigh” in thrift stores and yard sales as well as in antique shops in your area and online. Other than Zircon, it’s still relatively affordable. And it’s a pattern that will enhance even the most sophisticated décor! 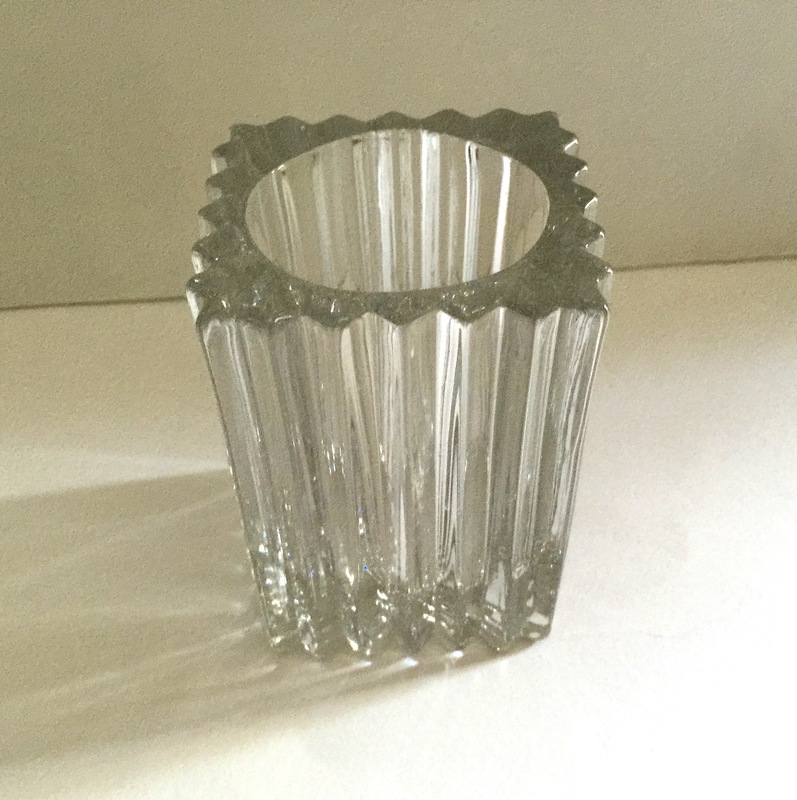 This entry was posted in Antiques, Tobacciana, Vintage Glass Patterns and tagged 1930s, Art Deco, ashtray, Bridge, candelabra, cigarette holder, Depression Glass, EAPG, Etsy, Heisey, Imperial glass, Ridgeleigh, serving pieces, Tobacciana, vintage glass, Zircon. Bookmark the permalink.